The advice stuck with him. Although becoming an architect had been a goal of his since childhood, Putnam first learned the furniture-making trade, working in California and then Nevada. For several years, he traveled and honed his craft, while saving enough money to put himself through college. Long aware of NC State University’s reputation and the prestige of the College of Design’s architecture program, he made the choice to return to his home state. 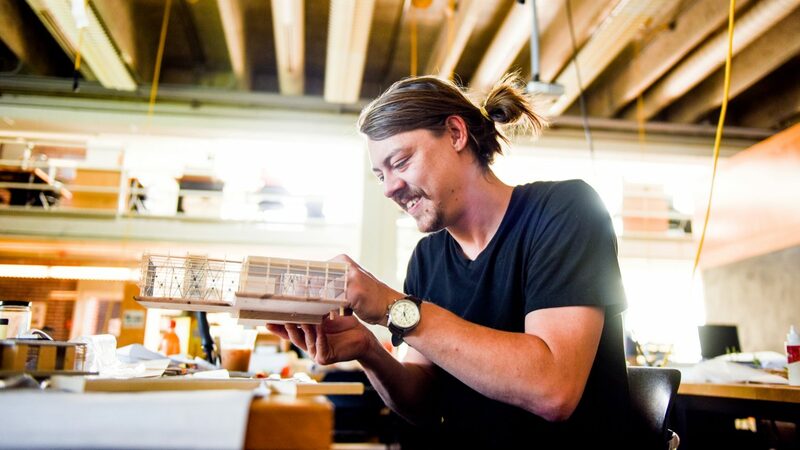 In addition to providing a means of supporting himself, Putnam’s background in woodworking has proven a helpful foundation for his studies at the College of Design. However, last summer, Putnam’s plans were nearly derailed. He found that it didn’t make financial sense for him to return to school for the college’s fifth-year professional bachelor of architecture program. The B.Arch. degree is a prerequisite for qualifying for the Architect Registration Examination (ARE). After sharing his situation with David Hill, AIA, professor and head of the architecture department, Putnam received transformative news. The College of Design offered him the Eduardo J. Catalano Scholarship, named for the renowned former chair of the Department of Architecture and established by Catalano’s two children. “It was a blessing, to be honest with you. I feel like ‘life-changing’ is a bit of a typical response, but it’s true. It is so true,” Putnam said. The impact of a scholarship can extend past the recipient, he added. The Catalano Scholarship has alleviated some of the pressure of a rigorous program, allowing Putnam to focus on academics and putting in the necessary studio hours to produce an exceptional thesis. After five years of studying with a faculty he describes as world-class and committed to each individual student, he is confident about what his future will bring. “Seeing a multitude of perspectives and people’s responses to different things through my time here has really made me grow as a person. Architecture is so specific, and with the skill set that they teach us here, we’re ready to hit the ground running,” Putnam said. Eventually, he would like to get involved in civic and cultural architecture. Securing such projects is highly competitive, but the reputation of NC State architects ensures that their work merits serious consideration. A new gift from Sir Walter Cabinet – a longtime, influential statewide organization with close ties to the General Assembly – to NC State’s Division of Academic and Student Affairs will benefit the Student Emergency Fund and support the construction of a welcome table for the lobby at the Crafts Center. Luis Aguilar, a member of the inaugural transfer class of the Goodnight Scholars Program, sums his personality by saying, "My culture has taught me to be generous and persistent, and to never forget where I come from." A first-generation college student, Aguilar finds support and motivation from his family at home and at NC State.